Does Amazon connector support both MFN and AFN orders? Yes, it supports both MFN and AFN orders. Does your Amazon Connector support multiple country seller accounts? Yes, the connector provides support for US, CA, MX, UK, DE, ES, IN, JP, FR,IT, and CN. Do returns get imported into NetSuite? No, Amazon does not allow the applications to pull the returns records. Are settlements imported into NetSuite? Yes, the report can be imported into NetSuite for every 15 days and the transaction record will be created to adjust the financials. Does this connector support import returns? Yes. It does support import returns. Can this connector handle the FBA Shipments to Amazon? 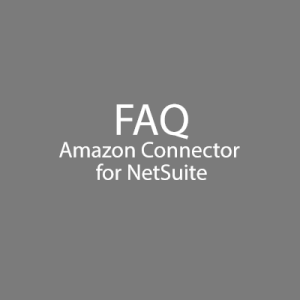 Yes, we can handle the FBA shipments from NetSuite.